The Ghears are an identity. They cannot be a part of a movement, genre or style, but they embrace many. It would be foolish to think that any band in the modern epoch is unique or original, but The Ghears are certainly isolated due to their resistance to be defined, not a conscious resistance, but victims of their own wayward influences and life experiences. Embroiled through life and reacting against religious bigotry, sectarianism and past working experiences with behavioural and mental disorders, the band found refuge and escape through their music. Their songs are formed from the pure and the raw, the melody and the dissonance, the chaos and the order, the themes revolving about empowerment and empathy. The Ghears noise is born of such influences as Motown, Krautrock, Psychedelic, Post Rock, Rock n Roll and bands Sonic Youth, My Bloody Valentine, Pixies, Spiritualised, Spacemen 3, Joy Division and The Velvet Underground among many others. Playing to thousands of people during their recent tours with Snow Patrol and The Mooney Suzuki, the band have carved a reputation for themselves as heavy hitters in the live performance league. Often stunning audiences and winning over many bewildered fans, including one of their tour hosts, Snow Patrol. The Ghears have become many things to many people, and that suits them fine. Like a fine unnamed sculpture, you know it has meaning, you know it feels right and it's just intangible enough to be interesting and make you want to look that little bit deeper. 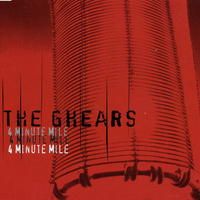 Unfortunately at this time we can't offer all the The Ghears - 4 Minute Mile tracks as individual mp3s, as some of these tracks exceed the shops maximum (9mins) download length. These longer mp3 tracks are available in the full album download.